So the big day has come and gone and you are about to banish your beloved wedding dress to the back of the wardrobe to be hidden under a polythene bag in the hope that in 20 years time your Daughter might want to wear it for her wedding... What are the chances of that actually happening honestly? I mean, you searched high and low for the perfect dress for your special day, you tried on countless gowns until this one finally stood out from the rest and you said ”This is the one!” Your daughter will do exactly the same in 20 years and your prized mothballed wedding dress will never see daylight again...Go on, Admit it. You could hide it away forever or you could “Rock the Frock” one last time and let it go out in a blaze of glory and have the whole fun filled session captured by Dan with his funky and vibrant photographic style in some cool locations where your dress would usually look really out of place! It’s not just newlyweds that can take advantage of “rock the frock” either! 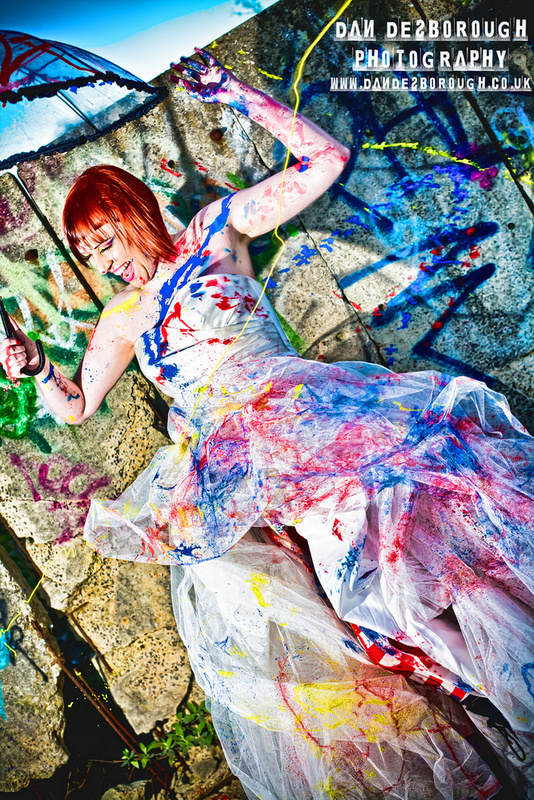 You may have your wedding dress already at the back of the wardrobe fighting off the moths so why not have an excuse to dress up in it again one last time and get it messy and have some fun?! The possibilities are endless when it comes to deciding what you would like to do, be it jumping in the sea, horseriding, rolling in mud or being covered in paint by your husband!! Whatever you choose will be tons of fun and it will be a day to remember. The amount of “trashing” you actually do it totally up to you so if you ever thought “I’d love to have my wedding photos taken on the beach or in woodland” then now is your chance. Packages can be tailored to suit and start from just £249 so for more information or to make a booking please visit the contacts page.